Harper Watters is a ballet dancer for today's generation. A social media maestro and a charismatic performer, the Houston Ballet soloist is equally at home in front of the camera hosting his hit YouTube series, "The Pre Show"; interacting with fans on his crazy-popular Instagram account; or showing off his beautiful classical technique onstage. It's a multifaceted identity that's proven to be invaluable to his career—and it's taking him to places he never even dreamed of. Watters was born in Atlanta, GA, but was adopted at two weeks old and raised in Dover, NH. He started tap and jazz classes at an early age. "I was a constant mover as a kid," he says. But his first exposure to ballet wasn't in the classroom—it was via a VHS tape of New York City Ballet's production of The Nutcracker. "I watched it 10,000 times," he says. "I even choreographed my own one-man Nutcracker over a holiday break." However, becoming a ballet dancer wasn't his end goal. "I was set on joining Alvin Ailey American Dance Theater," Watters says. "They were the first professional company I saw perform, and I was so inspired by the fact that dancers who looked like me were up on that stage. I researched how to get into the company, and found out that a ballet class was part of the audition. So, it was set—I had to become better at ballet to join Ailey." Watters started training at the Portsmouth School of Ballet in Portsmouth, NH, where he learned the fundamentals and "most importantly," he jokes, "the proper way to put on a dance belt." After Watters spent his sophomore and junior years at the Walnut Hill School for the Performing Arts, and attended the Washington Ballet summer intensive, a career in classical dance seemed more real. "I attended the Houston Ballet summer intensive the following year, and they placed me in the highest level, so I basically thought I was the next Carlos Acosta," Watters says. "The first day proved I was highly delusional." At the end of that summer, he was offered a contract with Houston Ballet's second company. "I loved that Houston Ballet was dancing amazing rep, and that their dancers had this incredible mix of finesse, confidence, and artistry," Watters says. In 2012, he was promoted to the main company, and by 2018, he was a soloist. These days, Watters is also a bona-fide social media star. But his internet fame didn't happen overnight. "When I first started my YouTube channel, I was only copying things I'd seen—viral challenges, trends—and those videos weren't doing very well," he says. "I just kept reminding myself that Beyoncé wasn't built in a day." Enter "The Pre Show," Watters' hilarious, honest, and unfiltered view into his dressing room shenanigans. " 'The Pre Show' started out of pure boredom. The conversations that happened between my dressing-room mates and I were too funny to not film," he says. Viewers agreed, and "The Pre Show" took off. "I think it resonated with people because they saw these unique dancers who werevocal and breaking stereotypes," he says. Watters recognized how powerful and positive social media could be. " 'The Pre Show' happened organically, and the response was incredible," he says. "Building a community of people was so rewarding, and that's what keeps me going. People follow me for me, for what I'm doing and who I am. And that taught me how crucial it is to be 100 percent authentic." That authenticity is on full display in the now-viral video of Watters and former Houston Ballet company member Rhys Kosakowski strutting their stuff on treadmills while wearing sky-high pink stilettos. It's been viewed over a million times, and it became the first in a series of heels videos that have brought Watters one opportunity after another. "People might see these videos and think, 'Oh, that's funny,' but it's way more than that," Watters says. "They embody this long journey towards self-acceptance." The social media success was also a big boost to his confidence. "In the heels videos I was projecting this persona that was sassy and fabulous, and I was like, 'Why don't I do this every day?' You have to own it, and once I did, I was able to explore new movement, shake off little things that used to really irritate me, and come into my own." Kosakowski, who's a mainstay on "The Pre Show," agrees. "Harper's showing people not to be afraid of who they are," Kosakowski says. "If you want to put on makeup and heels, do it. His message is exactly what this generation of ballet boys, and the whole ballet community, needs right now." Despite the success of the heels series, Watters is quick to clarify that he is first and foremost a classical ballet dancer. But that doesn't mean he isn't seizing every opportunity he gets, especially when it comes to educating the general public about the ballet world. "The treadmill video has been picked up by everyone from the TV show 'Broad City' to Elle.com, and their audiences don't know much about dance," he says. "Using these opportunities to shatter ballet stereotypes is important to me." One particularly special collaboration was with Urban Outfitters for its #UOPride campaign, which launched last June in honor of Pride month. "I think Harper shows that professionalism and authenticity don't have to be mutually exclusive," says Jason Donahoe, former senior content editor for UO. "To do what he does, onstage and online, requires an openness and vulnerability, a lot of self-knowledge, and a lot of self-acceptance. Dancer or not, I think everybody can learn from that." Unsurprisingly, Watters' dream project is totally original—and totally him. "I'd love to have a talk show, but with a performance aspect, like if Wendy Williams and Beyoncé had a child," he says. "I don't want to do anything that's already been done." 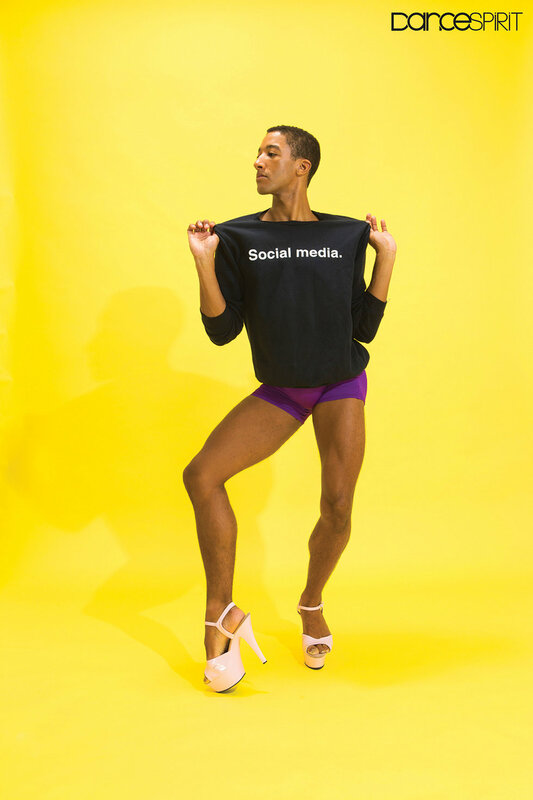 In the meantime, his priority is continuing his ballet career, while remaining tapped into pop culture and social media. "When I first started using Instagram, everyone laughed it off," he says. "But look at everything it can bring you, and all the ways you can use it. We're living in a time where the most powerful thing you can be is yourself. So, own it." Want to hear more from the social media sensei? Click here! A version of this story appeared in the February 2018 issue of Dance Spirit with the title "He Ain't Sorry."